Oven Roasted Salmon is an easy, wonderful one-pan salmon meal. 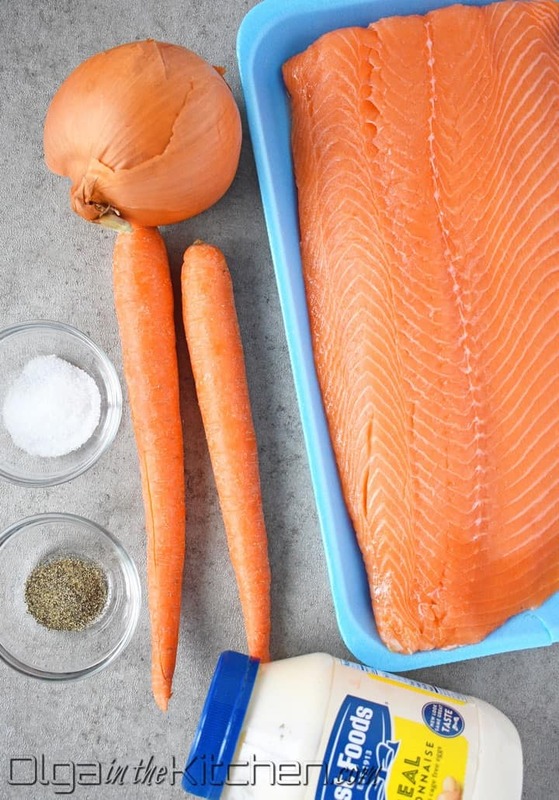 Slow roasting salmon yields fall-apart tender salmon paired with sautéed carrots and onions for the extra flavor. You will enjoy every bite of it! If you want an easy but fancy pan meal, it doesn’t get better than roasting salmon fillet. It can be a holiday, an event or simply a midweek dinner – salmon will rise to any occasion. 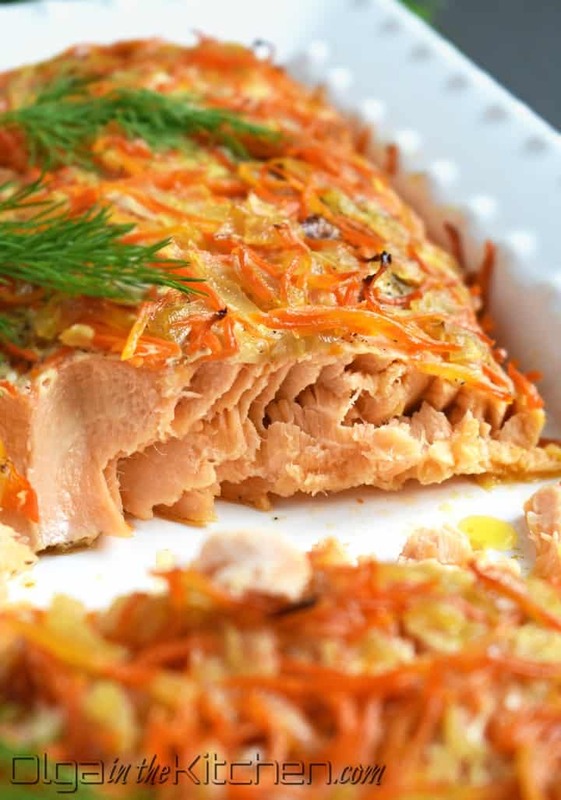 All you need is a 5-qt glass baking dish, prepared salmon and foil. This meal will simply replace main course or any side dish. This is probably the easiest salmon recipe I’ve ever made. Slow roasting slowly melts fat between the flesh and prevents the fish from overcooking or drying out. Instead, makes an evenly cooked, tender and not-one-bit dry fish meal. Reaching at least 165°F mark, is what makes this salmon fall-apart, flavorful, rich and literally melt in your mouth. Serve it warm or cold? The oven roasted salmon can be served warm or cold. If you’re like me, you’ll enjoy it warm. You can re-heat the whole fillet in an oven at low temperature for the guests or simply microwave a slice of it for 30-40 seconds to enjoy the next day. 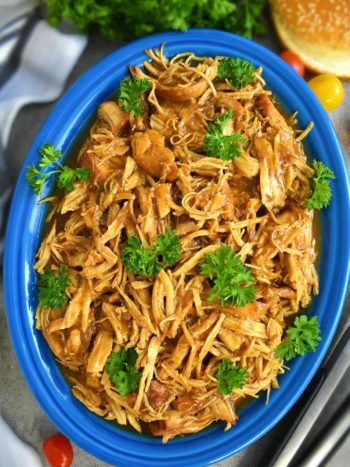 Most family members prefer it cold, which makes a perfect prep-ahead meal that can be made the day before and served next without any additional needed preparation. The general idea of the oven roasted salmon is to serve as main course. 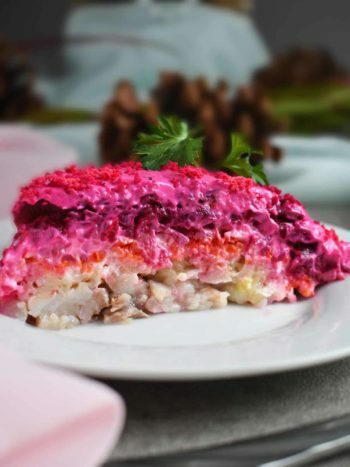 On a side, you can do any cabbage or cucumber fresh salad: Cabbage Pepper Salad, Cabbage Carrot Pepper Salad, Green Cabbage Cucumber Salad, or Cucumber Radish Salad. Potatoes are also a delicious combination; try Mashed Potatoes, Potato Wedges, or Quick Oven Roasted Potatoes. This recipe came from my mom. I remember every time someone would give us fish, whether it’s salmon, white fish or halibut, mom would always prepare it this way. A lot of times fish comes with little pin bones and slow-roasting completely softens those little bones, making them eatable. Other times she would cut into slices, dip into egg and flour and fry. I’ve always loved the oven-roasted version and I would simply enjoy it with a slice of bread. Overall, I love fish!! Buy the best salmon you can find and afford. I am using a 2.5 lbs skinless wild-caught salmon from Costco. You can use any thick fillet, swordfish, halibut or any salmon you caught yourself. All good choices and all will work great. Use skinless fillet or if it comes with skin – remove it. You want the fillet to completely absorb the remaining ingredients and the skin will prevent it. If the fish comes with little pin bones, they will become soft enough to chew. Use regular onion rather than sweet as the carrots already bring a bit of sweetness to this meal. The amount of salt brings a wonderful slightly salty finish to this dish and not bland at all. Gently slide cooked salmon onto a serving platter. It will be easy to break apart, therefore be extra gentle. This would be a good time to use more than 2 hands. Garnish with fresh dill or parsley before serving. Enjoy warm or cold, today or tomorrow. 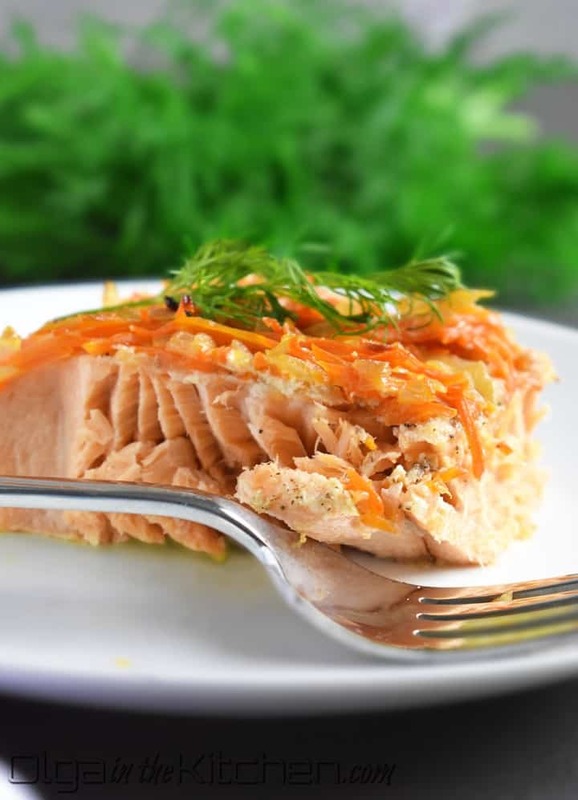 Refrigerate salmon once cooled if serving next day. 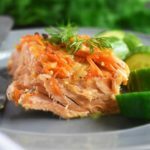 Oven Roasted Salmon: easy, wonderful one-pan salmon meal. 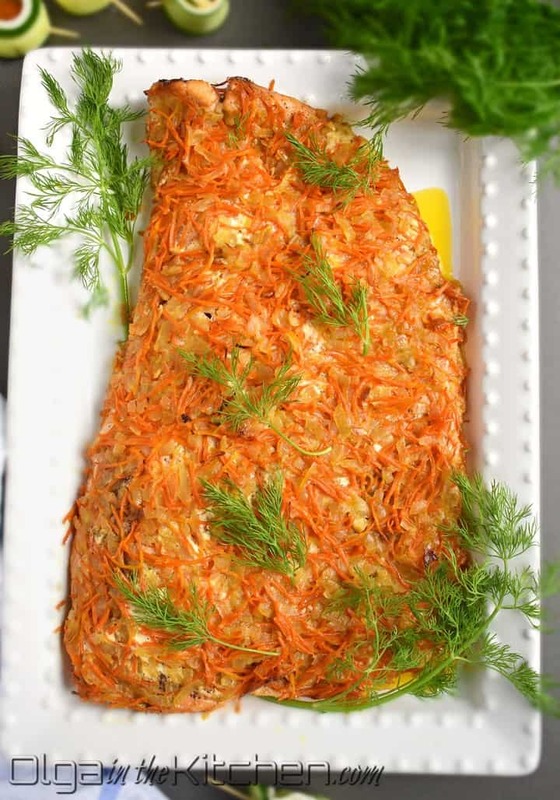 Slow roasting salmon yields fall-apart tender salmon paired with sautéed carrots and onion for the extra flavor. You will enjoy every bite of it! Preheat the oven to a 350°F. Prepare a 5-qt glass baking dish and set aside. You do not need to oil it. Wash 1 (2.5 lb) salmon fillet in cold fresh water. Pat the fish dry with a paper towel. Set on large cutting board lined with paper towels while you prepare next step. In a large skillet, saute 1 large yellow onion in 3 tbsp vegetable oil over medium heat until golden (about 5 mins). Add 2 large julienned carrots and saute additional 3-4 minutes, stirring often until soft and golden. Spread 2 tbsp mayo onto the skin side of salmon and sprinkle 2 tsp fine salt and 1/2 tsp ground black pepper. 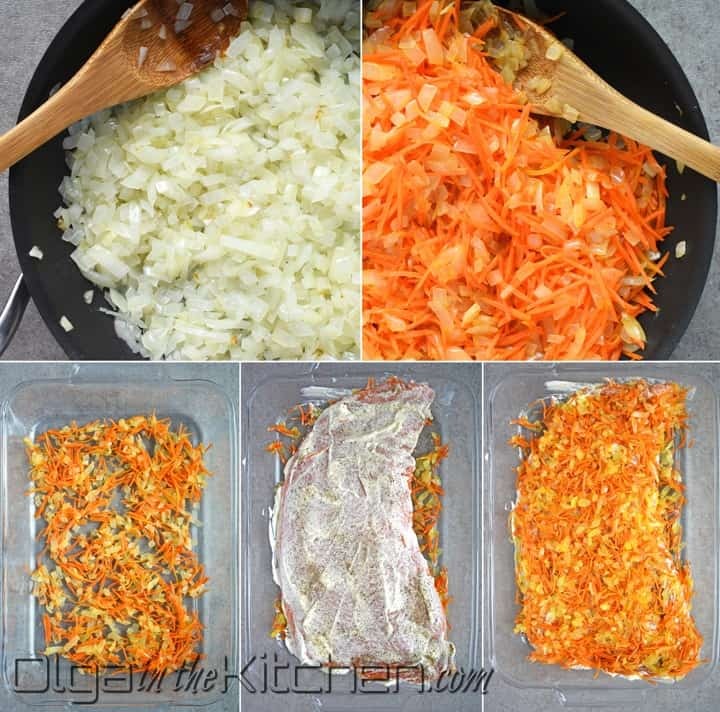 Spread about 1/3 of the sautéed onion and carrots into a glass baking dish. 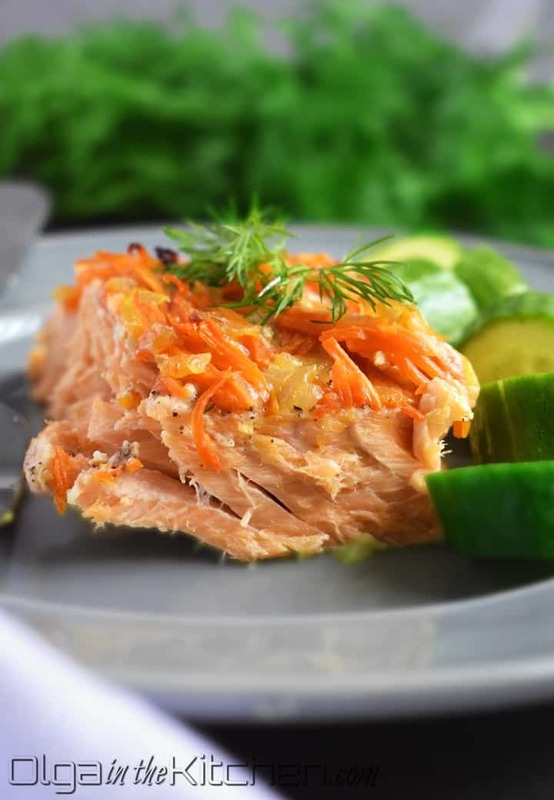 Transfer the salmon into the baking dish, placing seasoned side onto the sautéed vegetables. Now season the top of the fillet. Spread 2 tbsps mayo and sprinkle with 2 tsp fine salt and 1/2 tsp ground black pepper. Spread remaining sautéed onion and carrots onto the fish. Cover the dish with foil. Place into the preheated oven and bake for 30 minutes. 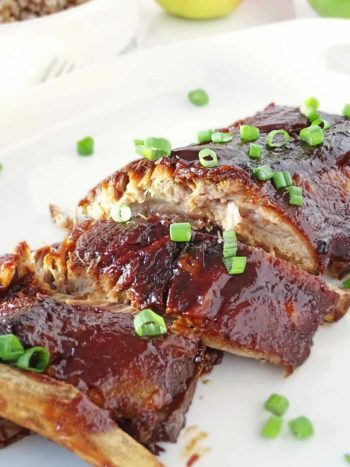 Reduce the oven temperature down to 300°F and continue cooking for 1 hour and 40 minutes. Salmon should be minimum 165°F. Thanks Jessica! I actually do make it a slightly salty because if it’s not, it tastes too bland. In my family, we like the salmon either saltier or spicier, but with kids spicy isn’t an option! You can always twist to your liking 🙂 The main thing is for salmon to really cook in so it’s tender! This turned out so good! I cooked for long like the recipe says and it turned out mouth-watering. I liked it a lot better than the salmon recipes that need to be baked for half hr at high heat. This is a keeper! !